When Charles Stewart Parnell died on 6 October 1891, his funeral to Glasnevin cemetry was one of the largest seen in Ireland. The ‘Ivy Day’ commemoration, which commenced the following year, has continued ever since and is one of the most enduring Irish commemorative events. 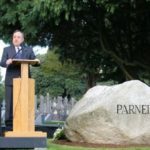 The Society marks the occasion with an annual lecture and wreath laying/oration at Glasnevin on/or about the Sunday closes to Parnell’s anniversary. The 2018 ‘Ivy Day’ commemoration will take place on Sunday 7th October, where the guest of honour will be Mr John Bruton, former Taoiseach and Ambassador for the EU to the United States. The Right Honorable Alex Salmond MP delivering the 2016 Ivy Day oration.